(15/P28) TRENTON – With trout season just around the corner, the Department of Environmental Protection’s Division of Fish and Wildlife is hosting its annual free Pequest Trout Hatchery and Natural Resource Education Center Open House this weekend, March 28 and 29. The Pequest Open House is one of the Division of Fish and Wildlife’s premier events, held every year the weekend prior to the opening of trout season to spotlight trout fishing and New Jersey’s natural resources. 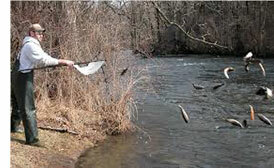 An estimated 100,000 anglers are expected to take part as trout season begins on April 4 at 8 a.m. The Division of Fish and Wildlife is stocking some 570,000 rainbow trout across the state throughout the spring, with 200,000 in the water and ready to be hooked on opening day. “Opening day of trout season is one of the most anticipated days on the calendar for outdoors lovers, connecting families and friends in the enjoyment of our state’s natural resources and splendid scenery,” added Division of Fish and Wildlife Director David Chanda. 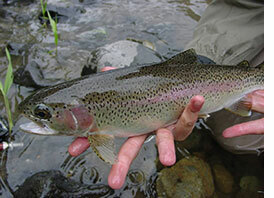 All designated trout waters are being stocked exclusively with rainbow trout. The staff at Pequest is shifting to more intensive production of rainbow trout, which is resistant to furunculosis, a disease common in cold water fish species that impacted brown and brook trout reared at the Warren County hatchery. This issue limited stocking in some of New Jersey’s trout waters last year. The Pequest Open House, which runs from 10 a.m. to 4 p.m. on Saturday and Sunday, offers a range of activities suitable for everyone from novices to experienced lovers of fishing and the outdoors. In addition, a Sportsmen’s Flea Market will offer deals on fishing and hunting equipment, outdoor gear and many other items. Food vendors will be available or you can bring your own lunch and enjoy one of three picnic areas located in the 5,000-acre Pequest Wildlife Management Area.